Loss of mobility can affect us all, but in the case of the elderly it can be devastating. Loss of function and independence can lead to isolation, further physical decline and depression. Choosing the right mobility aid depends very much on the person. Sometimes, all that is needed is a simple walking stick to give someone a little extra support when walking to help their balance and confidence. Walker zimmer frames and rollator frames provide a little extra support to be used inside, whereas a kitchen trolley is a great functional aid to assist you around the house. 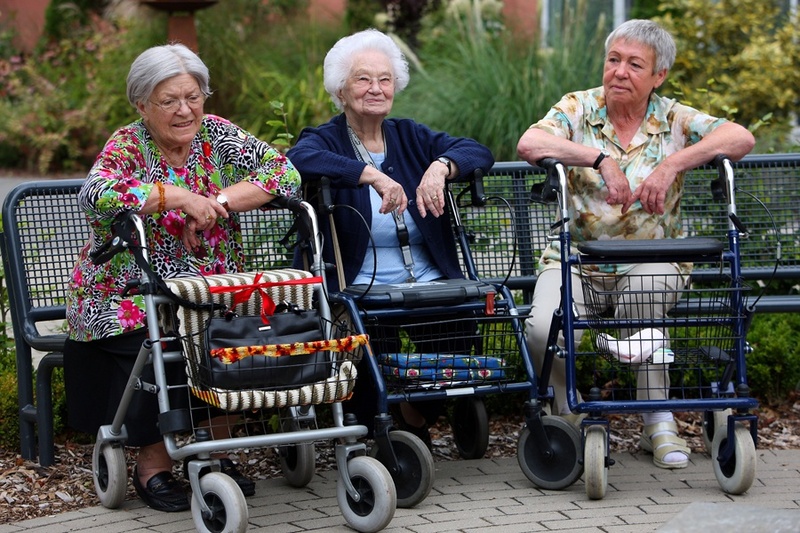 3 & 4 wheel rollators are perfect for keeping your independence out and about. Some have added seats and storage space depending on your particular need. 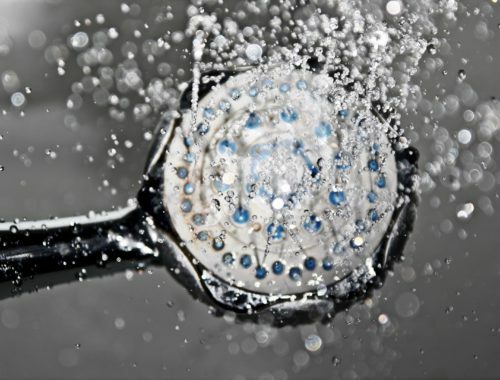 There are a wide selection of aids available so it is important to break down a persons normal daily routine, and look at everyday functional tasks to ascertain what specific equipment is most suitable for them. Walking sticks and canes are a great way to help you if you need a little extra support when walking about. 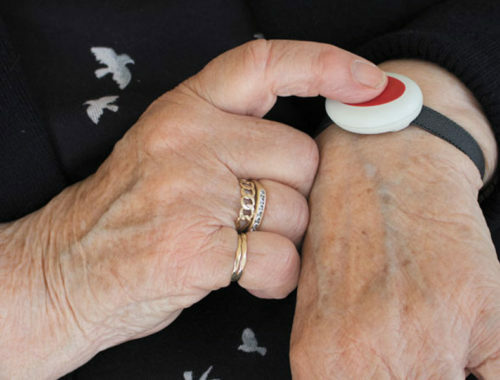 They give you increased confidence and independence to manage your daily activities. They come in lots of different styles and shapes, but essentially are all the same in that they help you manage your walking more easily. 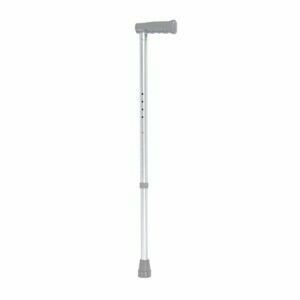 The NRS Healthcare Walking Stick is a height adjustable, lightweight walking stick. It has a large easy grip contoured PVC handle for comfort and support. 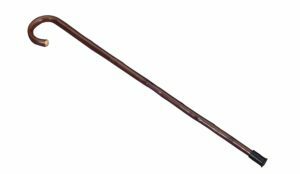 This is a simple, affordable walking stick, and is ideal to use both indoors or outdoors. It is height adjustable between: 840 – 1095 mm (33-43″), and can accommodate a maximum user weight of 127 kg (20 st). Folding walking sticks are ideal if you need to fold away for easy storage. The Drive DeVilbiss Healthcare Folding Walking Stick has a gel grip handle for comfort, particularly helpful for someone with a painful or arthritic hand. It easily folds away into 4 convenient sections to store away whilst out and about. (It comes in three different colours – black, red and blue). The NRS Healthcare Fischer Handle Walking Stick has an ergonomically shaped handle which fits like a mould around a person’s palm. As you grip the stick it evenly spreads the weight across your palm. It is ideal for someone who is suffering with arthritic fingers, hand and wrist, particularly those with rheumatoid arthritis. As it is moulded to the shape of your hand you need to decide whether you need a left or right handed version of the stick. It is lightweight and sturdy and is height adjustable. 710mm – 940mm (28″ – 37″). Some people prefer to use a Traditional Crook Handle Walking Stick to the typical ” L ” or ” T ” shaped design. The stick is made of solid chestnut wood, and is sturdy and supportive to use, but the disadvantage of using one is that it needs to be cut down to the correct height for the user. The rubber cap or ferrule at the end of the stick can easily be removed and fitted again. The Classic Cane has a matt black hardwood shaft and a metal ferrule. It has a decorated chrome plated cap and is more of a traditional cane. It certainly doesn’t offer the same support as the conventional walking stick with secure handle and grip, and is probably best for someone who only requires minimal support when walking. People with poor co-ordination and balance, or a noticeable weakness to one side of their body, as with a person recovering from a stroke, require a wider base of support from a stick. The Adjustable Tripod Walking Stick with its three feet provides additional stability for someone walking. It has a soft comfortable grip handle and is height adjustable (690 – 940mm). The Quad Walking Stick has a four legged base and offers even more stability and support. It is made of lightweight aluminium but is also very durable. Suitable for both indoor and outdoor use, it has a non slip, easy grip handle. It is also height adjustable (28.25 – 38.25″). The Ferrule is an important addition to any stick. Normally made of rubber it fits on the end of your stick and grips the surface of the ground allowing you to lean your weight on your stick with confidence, and prevent slipping. The wider the diameter of the stick the bigger the ferrule is going to be, so it is always important to check before buying to ensure you have the correct fit. Always take regular checks on the underneath surface of the ferrule as they become worn over time (very much like a car with no tread on your tyres, if the ferrule is completely worn down it is of little use, and needs replacing. This is just a small selection of walking sticks and canes available. It is very much up to the individual as to which is the most suitable one to buy. However, the most important consideration is how supportive and stable the mobility aid is assisting someone in their day to day activities. If you want to look at some of the Best Walking Canes 2018 then CLICK HERE. 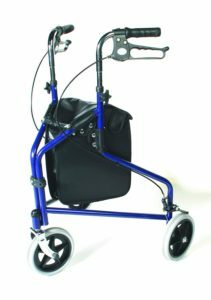 For people who are unsteady on their feet and need more support than just a walking stick, the walking frame is ideal. 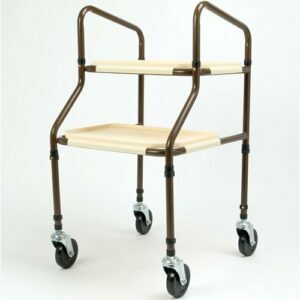 Often known as walker zimmer frames they come with either 4 ferrules on each leg support, or have 2 wheels at the front and ferrules at the back which makes it easier to walk with. People do use these walking frames outdoors but they are essentially an indoor mobility aid. 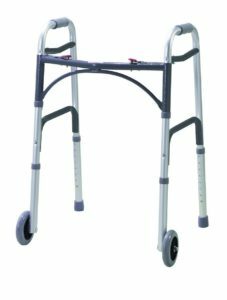 The NRS Walking Frame is made of strong aluminium but is also lightweight allowing it to be moved easily. It has soft comfortable handles for support and is available in 3 different adjustable heights. This is a well recognised and used walking frame, often known as a rollator frame because it has two wheels at the front to navigate forwards. At the back of the frame it has two ferrules, which provide good support and stability whether using it on wooden, carpeted or smooth laminate or tiles. If you are looking for a frame with easy storage and transportation then the Drive DeVilbiss Healthcare Folding Walking Frame is well worth a look. With its easy push button mechanisms the frame can easily be folded and stored away. It is lightweight and easy to navigate, allowing a good stable base of support for the user. Although walking frames are a useful mobility aid to use indoors, in my experience many people I see still struggle doing some of the day to day functional tasks, such as meal preparation or simply carrying items from one room to another. They would benefit from using an indoor trolley, often known as a kitchen trolley, as they are used to carry items such as a drink, or plate of food to and from the kitchen. This is where the Aidapt Height Adjustable Trolley is so useful. It has two trays to allow you to carry and transport items on. It has height adjustable clips that can easily be altered. It has 4 castors which allows to navigate and turn the trolley easily, and is more stable and less likely to tip over when you remove one hand from it, unlike the walking frame. This is by far a better option for many people inside their house than using a frame. The only down side to using it is that can sometimes race away from you when used on tiled or smooth flooring. A slight variation in design is the Days Flat Packed Plastic Shelf Trolley where the trays are slightly offset. They both are height adjustable and it very much depends on your personal choice as to which to use. Has two clip-on plastic shelves that can easily be attached and removed for easy cleaning and convenience. For safe and secure use the maximum user weight capacity is 125 kg (19.5 st). A little more expensive is the Homecraft Deluxe Trolley Walker with the added feature of having lockable hand brakes. This can be used as both an indoor or outdoor aid. It has easily adjustable handles to alter the height (755 – 905mm / 29.75 – 35.75″). The large 6″ diameter wheels offer great support and control, when you are using. Rollators are a great functional mobility aid that although used mainly used outside your home, can also be used inside. There are 3 wheeled rollators and 4 wheeled rollators which come in many different weights, styles and designs depending on your individual need and preference. Unlike the walking frame where at times you have to lift to move, the rollators can easily be pushed forwards with little effort needed. This helps people with reduced strength in their hands and arms, as well as weaker legs, or someone with poor balance and co-ordination. 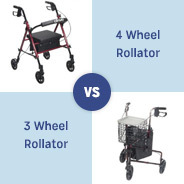 Which is the best rollator for you ? How much support do I need when I am walking around ? Where is the rollator mainly to be used ? – many of the 4 wheeled walkers are too wide to move from room to room inside. Do I tire easily and require regular rests – do I need a seat ? How much storage space do I need – shopping outdoors ? Your budget – How much can I afford to spend ? The Days Lightweight Aluminium Folding 3 Wheeled Walker is ideal to use inside or outside. At only 5kg in weight it can be manoeuvred easily around, but also folded away in an upright position for easy storage. 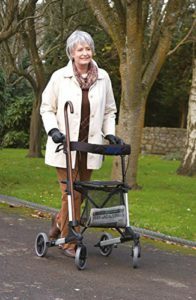 It has simple to use loop push lockable brakes and comfortable handles support, ideal for anyone with arthritic hands or weak grip. It has a durable carry bag to store items in. This 3 wheeled walker is lightweight and great to turn around, particularly where space is an issue. It is a popular, functional 3 wheeled walker. 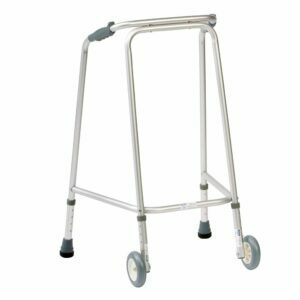 With its strong height adjustable steel frame, the NRS Healthcare 3 Wheeled Walker is a great walker to use. In addition to the easy clip on carry bag, it also has a basket and removable tray, which allows you more storage space. The detachable tray makes the NRS Healthcare 3 Wheeled Walker a perfect mobility aid to use, inside as well as outside, allowing you to carry drinks, food or anything you choose from room to room. It has adjustable handle heights (83 – 93cm / 32.75 – 36.75″). Also available is the Days 3 Wheeled Walker with Loop Lockable Brakes , which comes with a waterproof bag and comfortable ergonomic hand grips for the user. (chrome, silver grey, red and blue). If your looking for an ultra lightweight model then the Days Lightweight Aluminium Folding 3 Wheeled Rollator could be just the thing for you. The super lightweight frame only weighs 5.0 Kg, perfect for someone with reduced strength. 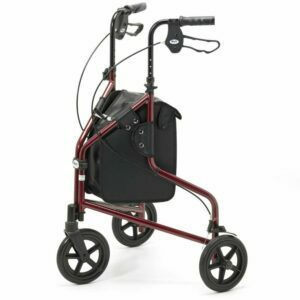 This attractive looking rollator has arthritic friendly grip handles, and easily folds away when not in use. It has a clip on storage bag, and is available in either red or blue with a 1 year warranty. 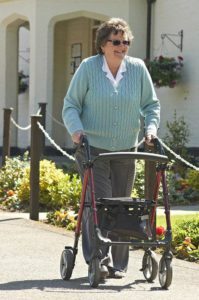 The NRS Healthcare Lightweight Four Wheeled Rollator with Seat is a perfect addition when you are out and about. It comes with a foldable, adjustable comfortable seat perfect when you need a little rest when out and about. The padded back rest support gives you extra support. The castor wheels at the front make it is easier to navigate and turn in tight spaces. It’s also lightweight and folds away easily for transporting or storing away. If you are looking for a rollator that folds neatly into a compact space for easier storage and transport, then the Days Deluxe Lightweight Rollator is ideal for you. In a standing position it folds away easily to just 28cm (11″ wide), and when completely folded down it measures 66 cm (26″ high), 28 cm (11″ wide), and 39 cm (15.25 ” deep). It has height adjustable handles with 5 height settings at 25 mm (1″ intervals), simple to use loop push lockable parking brakes, and comfortable ergonomic contoured handles ideal for anyone with arthritic hands or weak grip. 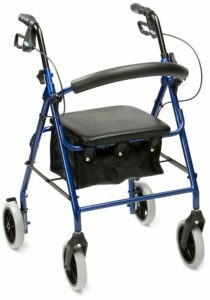 It is supplied complete with a canvas backrest, net carry bag and a walking stick holder as standard. 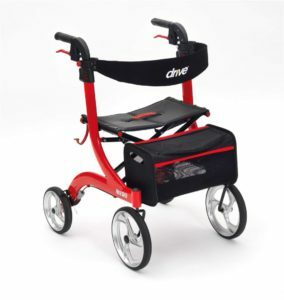 The Drive De Vilbiss Healthcare Red Nitro 4 Wheeled Rollator has a lightweight aluminium frame with a storage bag seat and backrest. What sets it apart for some of the other 4 wheeled rollators are the large 10″ front castor wheels, which allows it to turn easily, offering a stable base when pushing over uneven surfaces outside. It also has a cross brace design for better stability. It has easily adjustable handles (height range 85cm – 97cm), and a maximum user weight 135Kg (21 Stone). This 4 wheeled rollator’s fancy looking design sets it apart from other 4 wheeled rollators, but at a price. There are certainly cheaper rollators available to consider that offer exactly the same that the Red Nitro 4 offers. For the heavier bariatric user there are many products available to help make your everyday life a little easier. Here is just a selection of some high quality affordable options for you. The Homecraft Bariatric Offset Handle and Loop Walking Stick is a heavy duty height adjustable walking aid. It has the added advantage of a curved neck, which enables the user’s weight to be placed directly above the stick shaft, offering greater support and stability. It is designed particularly with the bariatric user in mind. With its four point base the Drive Medical Chrome Bariatric Quad Cane offers great support for someone who relies heavily on using a stick to mobilise safely. It has comfortable hand grips height adjustable from 30″ to 39″, and has a maximum user weight of 222Kg (35.5 Stones). When it comes to bariatric walkers the Heavy Duty Bariatric Folding 4 Wheeled Rollator is perfect. and comes with an extra wide padded seat for added comfort. It has an adjustable back rest and has a maximum user weight of 178 kg. If you are looking for a more affordable option then the Heavy Duty Aluminium Rollator could be the answer. It has a strong aluminium and durable frame, but is also surprisingly easy to manoeuvre around. 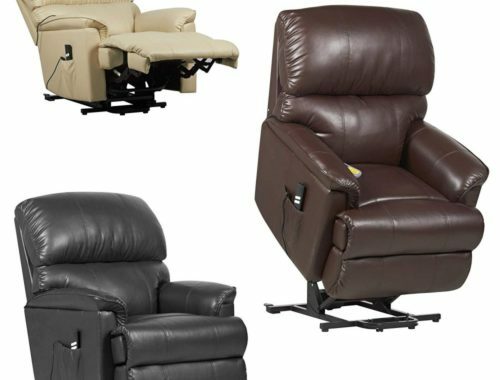 It has comfortable grip support with padded seat and backrest, and is able to accommodate a user weight of up to 26 stones. Many of the products mentioned here I have personal experience of using, from assessing people in my day to day job as a physiotherapist. Mobility aids for the elderly are an effective way of helping reduce the risk of falls and injuries, helping a person maximise their independence, and manage activities of daily living more easily and effectively, given them an improved quality of life. If you need any help and advice with any type of mobility aid, please don’t hesitate to contact me at mark@elderlyfallsprevention.com, and I will be happy to help. Hello ! Thank you for tackling a subject that many of us do not want to have to address. I am so grateful for your thoroughness in siting all the possible equipment uses necessary. As one who has had to at time rely on these products, I am so grateful you are showing the positive side. Many times we are embarrassed to have to use these, but ultimately they are in our best interest. I am so grateful the way you encourage the use of this equipment. I will use your site as a reference for sure! I do hope many people get to read this article. an important role in helping people maximise their daily function and independence. Hi Mark and thanks for this review. I had no idea there were so many possibilities. My mother is 78 and still going strong, but I expect we’ll be looking into these eventually. The fact that you’re a physiotherapist gives me confidence in your choices. Thanks for the feedback. My job as a physiotherapist helps me understand the importance that a mobility aid can make to a person’s well being and independence, and also assessing someone to ensure they have the correct aid. Please feel free to contact me in the future should you require any help, or advice choosing the appropriate mobility aid for your mother, and I will be glad to help. This is a great list. Using your mobility can not only be embarrassing but frustrating because your mobility is your independence. It is important to make sure those with limited mobility have everything they need to make them as comfortable as possible. I have to use some tools because I was born with a birth defect and other health issues so I understand how limited mobility can affect your life. Thank you for taking the time to provide useful information as such. 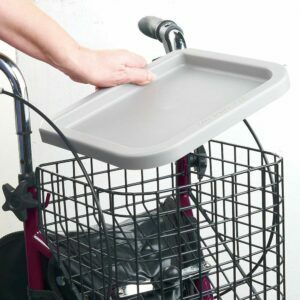 We all take for granted our independence and don’t always realise the different types of mobility aids that are available for the elderly. I’m glad you found the information useful and best wishes for the future. I have worked in a care home and can tell you that mobility aid is must have for all elderly. Regardless of how strong you think you are, elderly aging comes with a decrease function in our immune system and as such reduces our strength. There is no warning when immunosuppression sets in, so I encourage all elderly persons to rely on mobility aid. Luckily the post here is a great insight into the choice and ranges of mobility aid we should go for. I appreciate the feedback Peter. I see a lot of people working in both bed based homes and community settings in my job as a physiotherapist, assessing their mobility and making sure they have the appropriate mobility aid for them. As you said as we get older our strength, balance and co-ordination are all affected. Hey Mark, my Auntie purchased one of the 4 wheeled walkers which comprises rollator wheels, it’s been such a convenient solution for her weak limbs. Previously she had a zimmer frame but found the process of walking and lifting very uncomfortable. What she likes about the wheeler regards the way it folds up to enable storing in small places when she’s using her wheelchair, the padded seat is such a useful addition when she needs a break from walking plus it has a backrest which is an added bonus. It has a vinyl shopping bag which comes in useful when shopping and comprises user-friendly hand-grips where you’re able to adjust the height which enables catering for all sizes. It’s been a really useful aid for getting her around. or information about products, please feel free to contact me and I will try to help. I have realized how important these things are now that my mom has to be taken care of 24/7 after her massive stroke. There are several things here that my parents are using and they are valuable to them. One question I have though is, do medical professionals ever warn people using these too much as they still need to workout their muscles? This is actually something my dad has been told and that he needs to make sure my mother get’s some exercise by not using these “all” of the time. I am sorry to hear about your mum. I have worked with many stroke patients from the early stages of rehabilitation following a stroke, and patients who have had a fall and fractured their arm or leg, but who have residual weakness on one side of the body from an old stroke. With all the patients seen it is about building an individual programme tailored to their specific needs. Many people need a mobility aid, whether it is a tripod or quad stick to mobilise safely and transfer on and off a bed or chair. In addition, it is important that they maintain their existing strength, whether it is their core stability, or in their arms and legs and certainly, an ongoing daily exercise programme will make a significant difference going forward for these people to maintain their independence and well being.